Staff File Photo by Tim Barber Lane Kiffin has completed his first regular season at Tennessee. KNOXVILLE -- Lane the pain. Loudmouth Lane. Lane violation. Lil' Lane. Coach Lane Kiffin has been given many nicknames during his eventful first 12 months with the University of Tennessee football team, and few of them have anything to do with a solid season on the field that probably exceeded most realistic expectations. "Kiffin coaches Tennessee, at least when he's not setting the campus on fire," Atlanta Journal Constitution columnist Jeff Schultz wrote last week. Major college football's youngest head coach doesn't mind that reputation, at least to a certain extent. That's not much of a secret. He has consistently, from his first few hours on the job, maintained that things were going to be different. 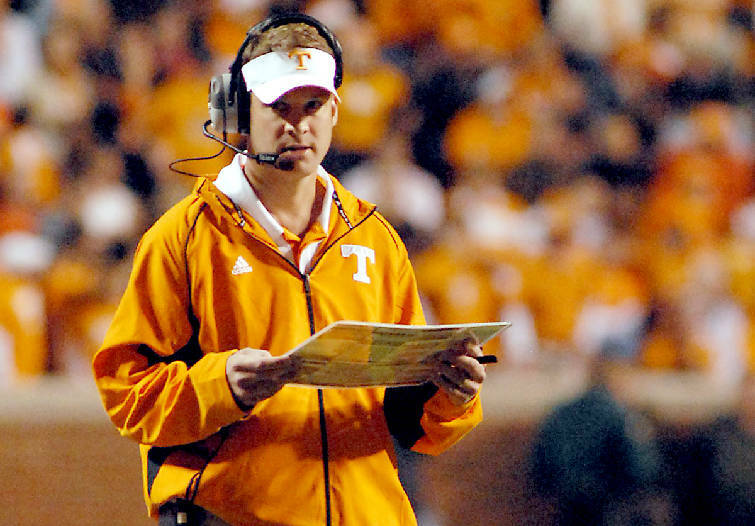 Kiffin was described by noted UT football historian Tom Mattingly as the program's "first real outsider at head coach since General (Robert) Neyland. "And even General Neyland had a connection to Tennessee," added Mattingly, noting some small ties between the Vols and the U.S. Military Academy at West Point. Little if anything about Kiffin seems synonymous with the Volunteers. He was born in Minnesota, went to college in California and never lived in Tennessee despite moving all over the country as a coach's son and then a coach himself. He doesn't wear much orange, because wife Layla thinks it clashes with his skin tone. Rather than slowly spit out clichés with a Southern accent, he strings together run-on sentences with inaudible mumbles sprinkled in the mix. He's openly thanked a controversial, soon-to-be imprisoned rapper for giving him "street cred" with lyrics that Lil Wayne "talked (stuff) like Lane Kiffin." "Lane is perfectly fine with you thinking he's brash and abrasive. He just doesn't want you to think he's reckless or stupid," said ESPN The Magazine senior writer Bruce Feldman, who has covered Kiffin since the coach's days as a Southern California assistant. "He's definitely embraced being a villain, to some extent. I can't think of anybody else who has done that in such a short span of time as he has." Kiffin's thoughts are never mysterious. In the rare times he doesn't tell you exactly what he thinks, he opens the window to his mind with a transparent facial expression. "Coach Kiffin is uncharted ground for Tennessee," Mattingly said. "This is an entirely different deal for everybody around here, and it's taken some getting used to." Steve White, a former UT and NFL defensive end who actively blogs from Florida for several football sites, was also slightly taken aback by Kiffin's style. White said he supported Kiffin and appreciated the way his depth-depleted team fought its way into a "good" bowl game, but he hopes the coach will live up to his promises to tone down his tongue eventually. "Initially, when he called out Urban Meyer, I was OK with that," said White, a sixth-round draft pick in 1996 who retired from a successful NFL career in 2002. "I understand how the game goes, and he was getting people to take notice. But as time went on, it did kind of start to wear thin a little bit. It's like with anything else, you know? When all the controversy first came up, you could kind of go either way with it and see the benefits of it, along with the drawbacks. "As time went on, though, you wonder if it stops being a controversy and starts becoming a laughingstock." White, like many others, claimed to see benefits to Kiffin's brash style. He stays in touch with at least 10 former teammates -- including All-America defensive end Leonard Little and All-SEC center Bubba Miller -- and he said his thoughts are in line with the group's general feelings. "Obviously, all that controversy, that's really not Tennessee football," White said. "Traditionally, we've usually tried to stay a little more low-key. But things change, you know, and overall I think it's been a net plus, actually. As long as we don't end up getting on probation because of it, I'm OK with it. "Honestly, more people are talking about Tennessee than they normally would have, considering our season." But more national has been made of UT's recent off-the-field situation, too. Feldman, who lives in Los Angeles, said he woke up Nov. 13 and quickly saw news all over the place about Mike Edwards, Janzen Jackson and Nu'Keese Richardson, who were arrested in connection with an attempted aggravated robbery. Jackson was reinstated to the team weeks later after charges against him were dropped, while Edwards and Richardson were dismissed from the program while preparing for their days in court. "Lane has made Tennessee a news story, constantly," Feldman said. "Whatever they do, for better or worse, is ticker-worthy. Stuff that goes on at other schools doesn't resonate. But if it's going on at Tennessee, it's becoming national news. It couldn't have been more than an hour or so after that Pilot gas station situation that it was full-blown national news." Kiffin's bravado isn't the only ingredient in that recipe. Feldman noted the timing of Kiffin's hiring corresponding with a boon of activity on Twitter.com and the rising popularity of college football blogs. "Whether Lane's come along at exactly the right time, or at the worst possible time, it's definitely made an interesting story," Feldman said. But whether that's the story UT supporters want in the news is another matter, particularly following a solid, building-block first season for a coach with no previous experience in the SEC. "I know the UCLA game stings for them, but to be 7-5 and to lose the two biggest games (Florida and Alabama) the way they did, they were really competitive," Feldman said. "On paper, it's a really big success. But because it's Lane Kiffin, the downside of all the comments and the posturing is that it feels like maybe he won't get the credit for that." "I think the thing that's interesting is that for all of Lane's bluster -- and I don't think it's all as calculated as he's said to get all this attention for recruiting -- but it's interesting that he's probably ended up underselling himself as a coach. From people I knew at SC, and even the guys I know who work under him now at UT, they all say how bright he is as a game coach and play-caller. ... And I think a lot of that gets lost because of everything else going on with Lane." Kiffin sees the situations differently. He said he didn't want to spend his first season at UT solely touting achievements for himself and his well-known staff before they arrived in Knoxville. "In my opinion, if you've watched us, you've seen that (bravado) slow down some," Kiffin said. "Now we have something to talk about. We have a quarterback who had a great year. We have the 17th ranked defense in the country. We have a tailback that went for 1,300 yards. "When we got here, I didn't want to sit up here and talk about what we did at USC or what Monte (Kiffin) did at Tampa forever. That doesn't matter very much, so we directed it a different way. Now we don't need to do that as much. Now we can focus on showing people, 'Here's our plan, here's what happened and here's why you should come here.'" Before he had that, though, Kiffin admitted to succumbing to unsavory tactics. "I've said it before, I don't love everything that we've had to do or what I've said," he said. "But I think that needed to be done, in my opinion, to put us on the map right away and to sign the players we needed to." "I think each job, you have a specific plan for. This job, coming in, I felt we had to get recognition right away. We had to get Tennessee out there. You can't have a long-term plan and take your time." Kiffin said the Vols wouldn't have signed a top-10 recruiting class last season without his publicized actions. He said the Vols wouldn't have turned four top-100 rated players from other programs without them. But the coach still isn't ready to disclose exactly what percentage of his actions were calculated. "That's kind of the question everyone wants to know," he said with a big grin. "I can't give that to you. I'm putting that in a book someday." White and several others have wondered whether Kiffin's distraction bolstered its future roster at the expense of distracting his current team. Good luck finding any current Vols to admit that, though. Senior defensive lineman Wes Brown said Kiffin's words "showed the world how much confidence he had in us to go out there and back him up, and we were happy to do it." Senior guard Jacques McClendon, a former Baylor School star, said he had no problems with Kiffin's actions and no doubts that UT had a program clean enough to withstand any investigation. "I've got to go with Coach Kiffin there. There's no such thing as bad publicity," McClendon said. "When your name's always out there, and you're always in the media, you can always be out there and market your school. Now, obviously, you've got to go about the right way of that, and you can't be doing bad things, but I don't think there's nothing going wrong here. You see the investigation, and there's nothing happening here. We're just another bunch of happy-go-lucky recruiting people, and we're just out there trying to get players here." "Coach Kiffin is new-school. He's a younger guy, obviously. He knows what it takes to motivate kids our age, and he's doing it different ways, obviously. Those different ways are going to be very successful here. We've had a little bit of success here this year, but there's a lot more to come in the future." If Kiffin achieves everything he hopes to at Tennessee, Mattingly joked that the coach could "stand on his head in the middle of Gay Street and no one would care." But the talk could quickly wear thin without victories to back it up, Mattingly continued. And that's assuming the program stays away from trouble. Mattingly compared Kiffin to Meyer and Alabama's Nick Saban as "hired guns." Saban is not Bear Bryant, and Meyer is not Steve Spurrier, but their quick paths in restoring championship-caliber football to each school "hasn't left many people complaining," Mattingly added. "They have their own styles and their own way of coaching and recruiting," Mattingly said. "Sometimes the fans get a little antsy about that, because they've been used to one thing for 40 or 50 years, and all of a sudden it's something entirely different. This is still the conservative South here, where people don't like change, but they will accept change when if helps you win. "That's the key. The bottom line is winning."